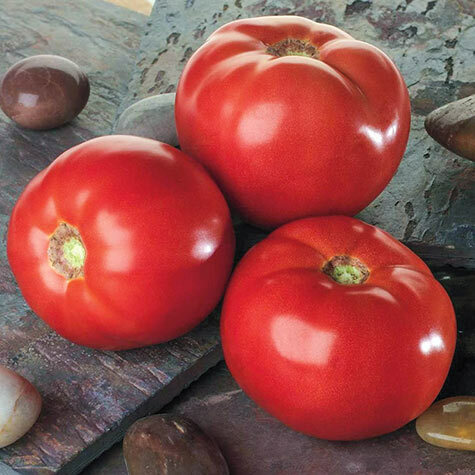 Bella Rosa Hybrid Tomato | Gurney's Seed & Nursery Co.
Good choice for fall planting. Very good heat setting ability and moderate resistance to TSMV, making it a good selection for fall planting in the South. Large to extra-large fruit size. Determinate. 74 DAYS. Depth: Sow seeds indoors 6 to 8 weeks before transplanting outside. Plant 1/8 inch deep. Fruit: High yields of large 10 - 12 ounce bright red tomatoes which are round, firm, and highly flavorful. A good balance of acid and sugar. Soil Requirements: Well drained soil high in organic matter. Can tolerate acid soil as low as 5.5 but prefer 6.0-6.8 range. Pruning: For better air circulation under the plant trim the bottom 16" of each plant of all stems and suckers other than 4-5 main stems. This will help to reduce the relative humidity around the base of the plants. Comments: Very good heat setting ability and moderate resistance to TSMV, making it a good selection for fall planting in the South. Large to extra-large fruit size.